This closeup is misleading: few gorgeous plants are as subtle and inconspicuous as the brown flowered priairie ball cactus: Escobaria missouriensis. The flower color can vary from nearly green to almost russet, and usually falls into an in between shade akin to copper--an unusual color for any flower. This beautiful miniature native cactus once grew by the untold million across the shortgrass prairie of the Great Plains: much of its range has been plowed or overgrazed. I have only found it a half dozen times around Denver, usually in the lower parts of the piedmont, and rather just a few specimens each time. I'd be hard put to find most of these locales again! It also occurs in the Intermountain area of Western Colorado, Utah and beyond. The species has been split into varieties (v. caespitosa) and even new species (E. marstoni), and one could accumulate quite a bevy of variants over time. Well worth doing. 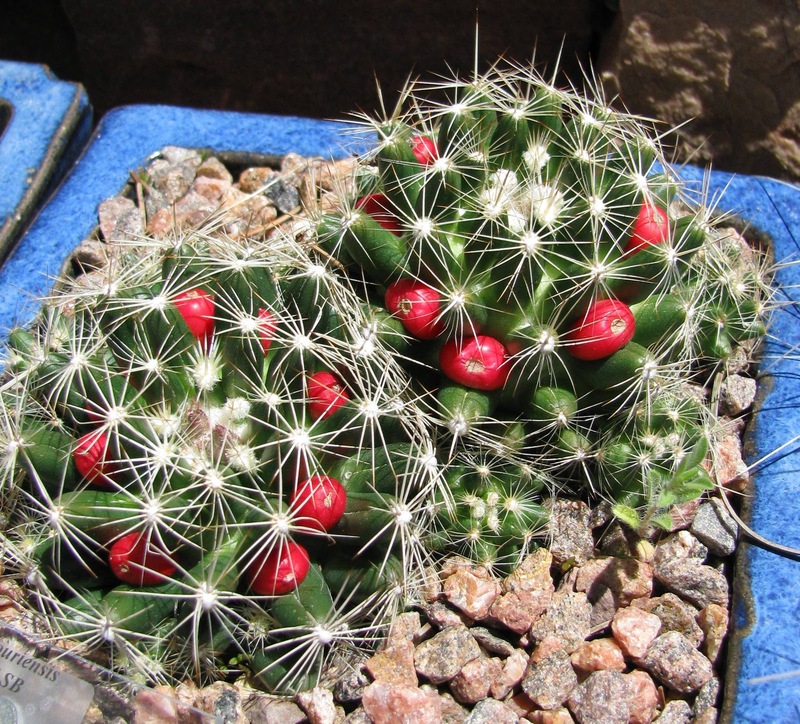 Even when it is done blooming, the prairie ball cactus is still appealing with these bright red fruits that persist a whole year and are often more visible than the straw colored flowers. It underscores how close Escobaria is to Mammillaria: there are a bundle of mammillarias with similar bright red seedpods. Cactus collectors have been accused of overcollecting rare cacti (and there are some reprehensible people without a doubt). Of course, all the cactus collectors in the world have not done a fraction the damage that other human activities have wrought on our native plants: farming, housing, ATV's and cattle are the real culprits. 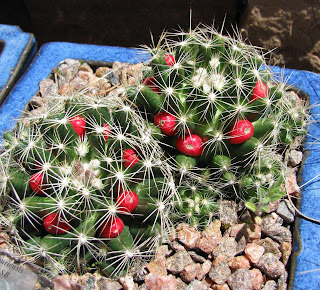 And nowadays, there are dozens of nurseries in America and many more abroad producing an enormous volume of our native cacti from seed and cultivated plants: I know countless people who grow native cacti and would never dream of collecting a wild specimen. The real enemy is ignorance.